(CNN) - Mitt Romney will begin preparations for this fall's series of presidential debates this week when he goes head-to-head with a stand-in for President Barack Obama, a Romney campaign source said Saturday. Separately, Romney senior adviser Kevin Madden said Saturday that Romney will prepare Tuesday through Thursday at the Vermont house of former Massachusetts Lt. Gov. Kerry Healey. The source also said that the campaign has not yet decided whether Romney will attend any public events this week. CNN reported last week that Sen. 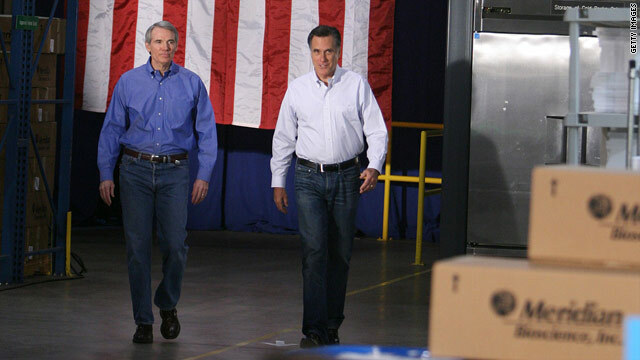 Rob Portman of Ohio has been tapped to aide Romney as the stand-in for President Barack Obama. Portman described the role in an interview with CNN's Wolf Blitzer on Thursday. "You try to get inside their head and figure out not just what they're going to say, substantively, but also how they're going to say stylistically," Portman said. "You try to be tougher than they [Obama] will be so that half way through the debate, Mitt Romney... says, 'it's not bad, I'm glad Portman is not out here on stage.' "
Romney and Obama will debate three times in October, and their running mates will debate once separately. In addition to his seven terms in the U.S House, Portman's policy expertise includes service to the first Bush administration as counsel and director of legislative affairs, and to the second Bush administration as director of the Office of Management and Budget. He also held the post of U.S. Trade Representative and is in his first term in the U.S. Senate. Romney officially became his party's presidential nominee this past week. Romney is a hands-on doer, I don't think he will do well in his debate against Obama. Obama is a fantastic saleman that can make an old cluncker sound like a Rolls Royce and people will nod their heads in agreement with Obama. Obama is too well scripted. He is a good talker, not a doer, not a hands-on. Good talkers are the ones who usually convince people on opinions and issues and convince those people to do things that they themselves don' t want to do. I'm excited to see Romney go up against the President and try to shoot him down and demonize him and his policies. This will be the best National Presidencial debate in History and seen all over the World from every country. Mr. Romney honestly doesn't have anything close to a chance of makeing points from debate # 1. How can the Americans trust a fellow like Romney.What is he hiding in his tax returns? Scripted, constructed, and crafted to meet the performance standards and demands of only the most elite teleprompters. Ron Paul was right. If he doesn't give any details during the debates, there's no reason to vote for him. Now here's two guys who look so un-cool in blue jeans if I were their handlers I'd tell them to go with kakis. GWB could pull it off but not these guys, they just aren't blue jean people which spells phoney to me. As the Mittster asked the woman in the crowd how she is doing, she replies Im living in my car with my 2 children & Bishop Romney laughs away & tells her Well I hide Tens of hundres of Million overseas so there is no Funding to help you PEASANTS. Silly poor people, For they are beneathe Me for I am King Tabby Nackle Romney!!!!!!!!!! When Romney spoke at his acceptance he looked like he was going to cry any minute and even though I don't support him I hope he doesn't start to cry during the debates. This is going to be very nasty coming from both parties. They will need to find a Democrat for this. Not a single Republican in all of America exists that lies and can speak with the kind of hate and anger that consumes Barack Obama. Hold back from correctly calling Obama on his lies, to question the messiah and call him on his hate and lies will make the lib-a-lib alphabet media scream racist, even though klan member Democrat senator Robert Byrd yelling the N word multiple times on National television didn't produce a single Democrat calling him a racist, as if the creators of the worst thing for minorities since slavery, the great society, have the nerve to call anyone a racist. What? Romney is spending so much of his time at his summer vacation home in New Hampshire, mingling with billionaires at fundraisers or preparing for a debate that is not scheduled to take place till October instead of doing live events or campaigning for President of the United States. Heck, Clint Eastwood would have made interesting president but unforunately lost that debate to empty chair. Typical millionaire corporate raider who delegate everything to his minions and hiding from instead of explaining how he plan to create 12 million jobs for us. Why should we vote for him if he can't be bothered with 99 percent of American citizens. Romney has one very big problem. He has to figure out a way to put a spin on all the lies and half-truths that he has been telling since the beginning of his campaign in such a way to make them believable, while at the same making it impossible for President Obama dispute them. It's never gonna happen! Romney will etch-a-sketch back to the middle to appeal to independent voters during the debates by using responses that President Obama has given in the past, because he knows that the lies and dog whistles he is now telling will not work with independents and would be debunked by the president. Mitt's going to take the Ronald Wilson Reagan speed acting and debat class . I can't wait to see how many Reagan gestures and verbs he will use . Why not have Clint Westwood teach Romney how to talk to a chair ! Romney debating President Obama is like a checker player going up against a chessmaster. President Obama will send Romney home crying with his little checker board folded up under his arms.